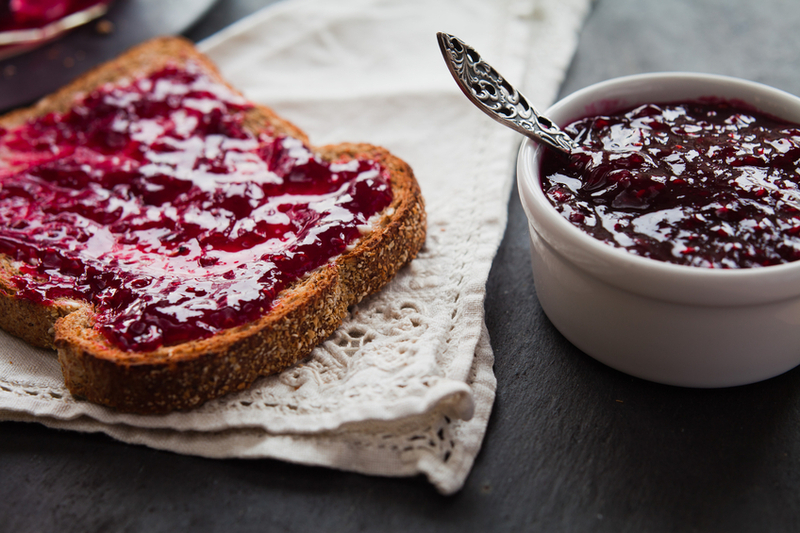 Toast with jam is a common breakfast food. To jam means ‘to press or squeeze in a small space,’ ‘to block by crowding,’ and ‘to push violently on or against something’ or ‘to put something in position with a quick movement.’ In addition, jam means ‘to interfere with a radio or TV signal’ and, when we say that a machine jams, we mean that it is no longer usable. In music, to jam means ‘to play in a spontaneous and improvised way.’ As a noun, a jam is the state of being jammed and, colloquially, it is a hard and complicated situation. Wendy jammed the clothes into the suitcase. The roads are jammed with holiday traffic. The road is blocked––jam on the brakes! Simon jammed the key into the lock. The signal is jammed and we can't get any reception. Why does the printer always jam when you need a document in a hurry? The musicians were jamming in the studio. I guess you could say Rachel is in something of a jam; she's abroad and she's had her passport stolen, along with all her money and credit cards! In the UK, jam is also a sweet preserve made of fruit, or occasionally vegetables, and sugar. The fruit and sugar are boiled until they reach a point where they set (become firm) and then the mixture is put into jars for storage. It is mainly eaten on toast for breakfast. In the US this type of preserve is also called jelly, whereas in the UK, jelly is a dessert made from gelatin. Jam, the verb, dates back to around the year 1700, with the meaning ‘to become wedged’ or ‘to wedge something tightly.’ Nobody’s sure where the term came from, but some think it may be imitative (the sound something wedged tightly would make). Others think it may be a variation on a Middle English verb, cham (meaning ‘to bite down on something’ or ‘move your teeth together’). Jam, the fruit preserve, is also from the early 18th century, and probably comes from the verb (to make jam, you crush fruit up while it’s cooking). The noun, meaning ‘the state of being jammed,’ first appeared around the year 1800. The mechanical meaning of jam, when a machine does not function, first appeared in the mid-19th century (as both a verb and a noun), and the meaning spread to interfering with a signal in the 20th century. The musical sense appeared in 1929, and was coined by jazz musicians.